In order to stop an ecological disaster, Ken Kitazawa used Chemical Z, a new form of the Professor’s original substance Chemical X, to destroy a giant glacier. 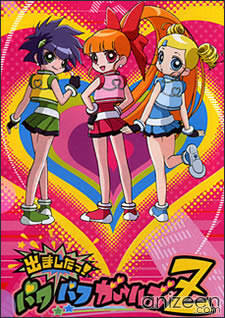 The Powerpuff Girls Z are the main heroines of the series. They are three thirteen-year-old girls from three different families, unlike the original Powerpuff Girls who were sisters created by Professor Utonium and attended kindergarten. When Chemical Z exploded into multiple black and white lights, Momoko Akatsutsumi, Miyako Gotokuji, and Kaoru Matsubara received white lights when they protected nearby children from it. 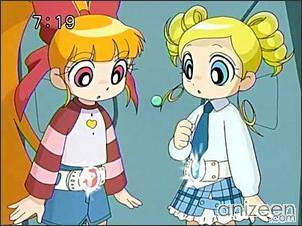 Under the condition to keep their identity a secret as long as their needs were met, the girls transform into Hyper Blossom, Rolling Bubbles, and Powered Buttercup to protect Tokyo City. Momoko Akatsutsumi / Hyper Blossom. 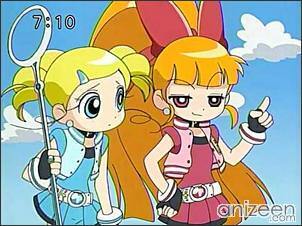 Momoko is the first member of the Powerpuff Girls Z squad. 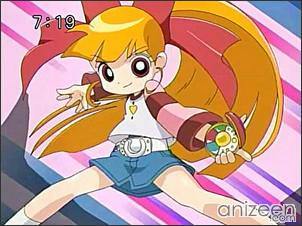 She transforms using the phrase “Hyper Blossom” and fights villains with a yo-yo. Like the original, she’s the self-proclaimed leader of the team. She is a bit boy-crazy, and is an otaku. She is very familiar with the maho shōjo genre, along with some typical anime/super sentai concepts and is famous for being a “hero maniac” in school, especially by Kaoru. Momoko also has a strong appetite for candies and other sweets, and spends much of her time snacking. Because of this, most of her attacks are named after food. In addition, she dislikes celery and is afraid of bugs and dentists. Although she can be easily distracted and has been known to whine, Momoko tries her best to protect Tokyo City, lead the girls, and help her friends regardless of her situation. Often she can be very clever and crafty when needed, usually being the first come up with a plan to trick or defeat villains/monsters. She has a younger sister named Kuriko. She is represented by hearts. She dreams of being married in the future. Miyako Gotokuji / Rolling Bubbles. 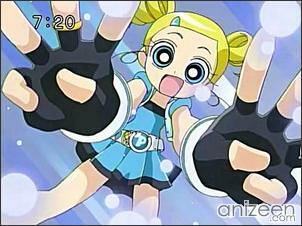 Miyako is the second member of the Powerpuff Girls Z team. 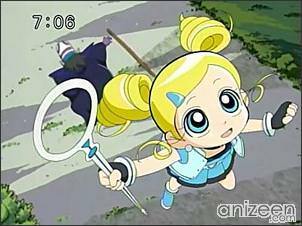 She transforms using the phrase “Rolling Bubbles” and uses a bubble wand as a weapon. In comparison to the original Bubbles, who was known for being the most childish of the girls, Miyako is quite mature, but she’s the ditsiest member of the three, often appearing a bit clueless, and doesn’t seem to understand her powers completely, along with a few other things. She is the only member of the girls who, like some villains, end a few sentences with a phrase. Her phrase is desu wa. She is very friendly and polite, as she always uses honorifics at the end of names, although she too can be angered when provoked. Trendy and stylish, Miyako enjoys shopping and fashion the most. Although she is popular with the boys at school, she already has feelings for Takkaaki (Taka-chan), a boy who saved her from bullies when she was six. She also uses curlers (3 balls on each pigtail) when going to bed. 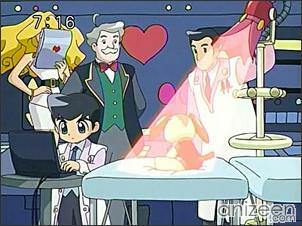 Miyako/Bubbles remains typified, however, by the original’s compassion, gentleness and innocence, as well as her love of animals and her favorite doll, Octi. She lives with only her grandmother. Her parents live in Kyoto. She is represented by bubbles. She dreams of being a fashion designer or model in the future. 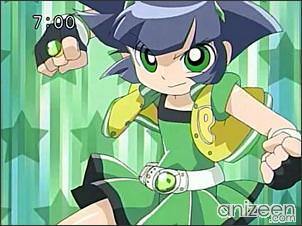 Kaoru Matsubara / Powered Buttercup. 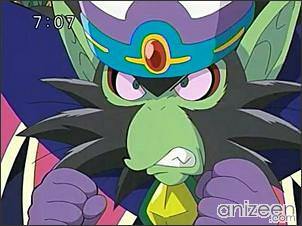 Kaoru is the third and final member of the Powerpuff Girls Z team. 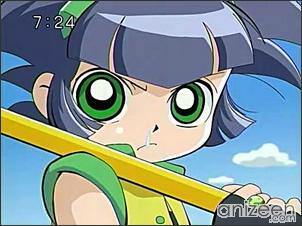 She transforms using the phrase “Powered Buttercup” and uses a Daruma Otoshi hammer. She hates skirts and other girly things, which is the reason why she was reluctant to join the group. In fact, she even hates girls who are too girly. Like the original Buttercup, Kaoru is a tomboy and is the most easily enraged of the three. Famous for being the most athletic girl in school, Kaoru enjoys all kinds of sports and spends a great deal of time watching sports on television. She is especially good at soccer. Much to her dismay, she is well-admired by a lot of fangirls in school. Demashita! 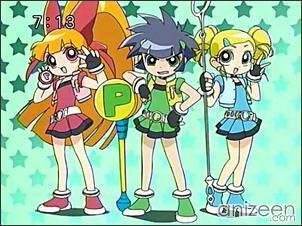 Powerpuff Girls Z (出ましたっ!パワパフガールズZ) is the name for a Japanese television anime based upon the American animated television series The Powerpuff Girls. The anime is produced by Cartoon Network, Toei Animation, and Aniplex; with Yoshiya Ayugai and Mark Buhaj of Cartoon Network, Hiromi Seki, Hideo Katsumata producing, Hiroyuki Kakudou directing and Miho Shimogasa (of Sailor Moon fame) doing character design. As production occurs in Japan, Craig McCracken, the original creator of The Powerpuff Girls, is not directly involved in this project. 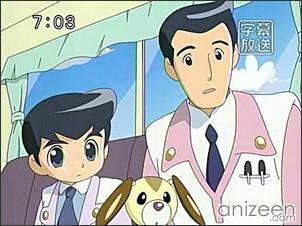 The series, an anime reimagining of The Powerpuff Girls, debuted in Japan on July 1, 2006.